Access to this Old Orchard Drive property was closed off after flood water consumed the yard and rose against the front door. A car eases its way through heavy rain and flooding on Saturday. A tree was downed by the wind and rain across Ai Creek in Swanton. 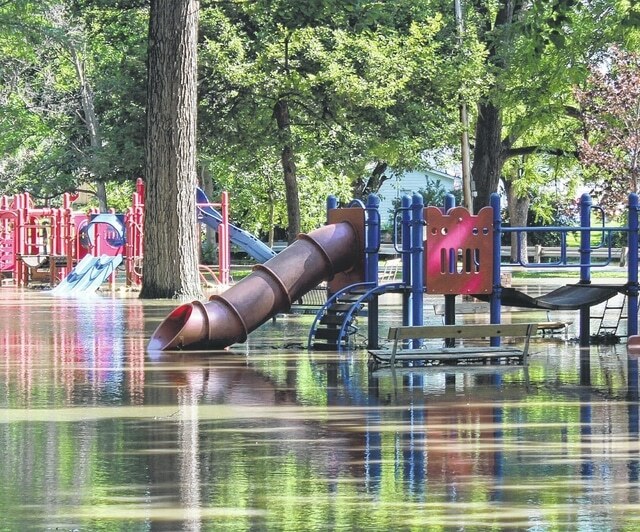 The playground at Swanton’s Memorial Park was flooded on Sunday morning. At times Saturday, it appeared Fulton County was in the middle of a tropical storm on the Atlantic coast. Heavy rain and winds caused problems throughout the area. Streets, basements and waterways were flooded as 3 to 7 inches of rain fell over the area. A flood warning remained in place into Monday. Many roadways were closed to traffic or impassable Saturday and Sunday due to high water. They included, but were not limited to, US20A east of Delta, US20 near County Road 7, the area near the intersection of County Roads 2 and F, County Road 25-2 and County Road J, County Roads 21 and N, County Road 9-2 north of Pike Township, and multiple areas of County Road J.
US20A south of the Ohio Turnpike remained closed into Monday. When there is high water, the Fulton County Sheriff’s Office urges drivers to use extreme caution. Do not drive around any road closed signs. County roads still closed as of Monday morning were: County Road 7 north and south of State Highway 120; County Road F/County Road 1-2, near big curve; County Road N between County Road 20 and County Road 21-2; County Road M between County Road 23 and County Road 21; County Road L between County Road 23 and County Road 21; County Road J between County Road 23 and County Road 22; County Road J between County Road 23 and State Highway 66; County Road 23 between County Road L and County Road J; and County Road 24 between County Road B and County Road BC. The high water flooded much of the lower portion of Memorial Park in Swanton. The playgrounds, volleyball courts and a large portion of the baseball field were under water. In Wauseon, fire and rescue crews had to make their way through high water to the site of a basement collapse. The city’s area at the entrance of Walmart and Skye Cinema was also flooded. The Dollar General in Fayette was surrounded by water. Just to the north, in Lenawee County, Horton Highway collapsed due to the flood waters. The winds added to the damage. A large tree was down across Ai Creek in Swanton’s Memorial Park near Garfield Avenue. And a fallen tree heavily damaged a shed and fence in northeast Swanton. In Henry County, downtown Hamler was flooded, and a state of emergency was declared. Sauder Village was closed on Sunday due to the flooding. Unfortunately, more rain is forecast for this week, though it is not expected to be as heavy.